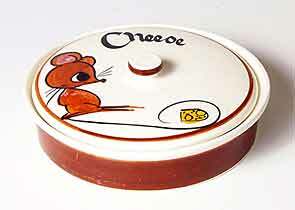 Toni Raymond cheese dish - 5⅜" (136 mm) diameter, 1¾" (44 mm) high. Toni Raymond Pottery was established in Torquay, Devon in 1951. The company is known for its decorated earthenware table and kitchen wares. In 1967 they acquired Babbacombe Pottery which had been operating in the same area since 1949.